I’m sure it is difficult to write a short book, seeing as it’s certainly difficult to write a short book review! 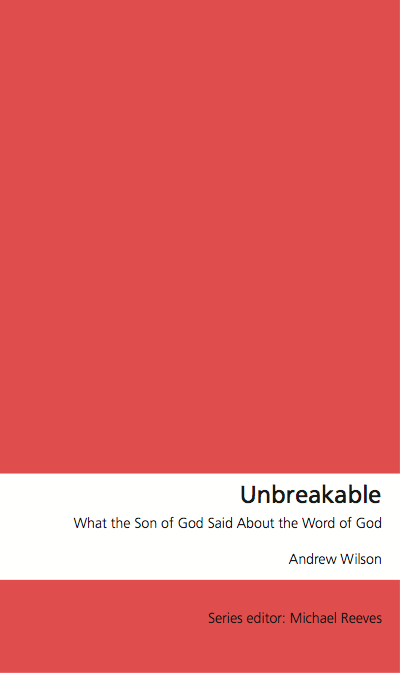 I am attempting a short review of a short, but engaging, book by Andrew Wilson called Unbreakable: What the Son of God Said About the Word of God. In Unbreakable, Wilson lets Jesus be our guide to the Bible: “I trust the Bible because I trust in Jesus” (p10). So what does Jesus believe about the Bible? He trusted its authority (Matt 4:1-11), its inspiration (Matt 22:41-46), its unbreakability (John 10:22-39), and its coherence (Mark 12:18-27); and that’s all in the first four chapters. All chapters handle different aspects of Jesus’ relationship with God’s Word. The writing is quirky, winsome and clever – but never too clever. In fact, the chapter And it Happened was so poetically written that it was like reading a (little-‘o’) orthodox Rob Bell; much like a musician who employs silence, the page had so much white space! My complaints are so miniscule in comparison to my enjoyment, but complain I must. Aside from a take on Psalm 82 that I consider faulty (human kings rather than spiritual beings), I’m unsure why the poetic survey mentioned above, subtitled The Storyline of Scripture, ended with the resurrection. Even a full-preterist would complain that he didn’t get so far as AD70! Perhaps Wilson was simply tracing creation to the beginning of new creation? But still, The Lord of the Rings doesn’t end with the appearance of Gandalf the White to Aragorn, Gimli and Legolas, and neither does our story. But back to the positives. In addition to Wilson’s excellent approach, writing, and message, I took delight in his subversive “skewering” of the New Marcionism. Since Wilson has tangled with them before, he shrewdly (and intentionally?) used their own “Jesus-lens” (or “tea-strainer“) approach against them by showing Jesus’ absolute commitment to even the “difficult texts” in the Old Testament (Luke 17:26-29), while creating some of His own in the process (Matt 19:4-6)! And no, I’m not a Nephilim. This is a small book. And did I mention that Unbreakable is small? 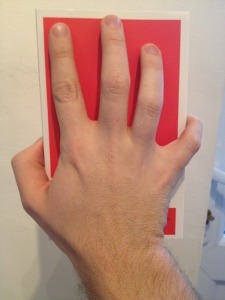 Using a Biblical measuring system (Isa 40:12), it’s one hand (see right). 78 pages with notes, 65 pages without. Chapters average 4 pages. This results in punchy, bite-sized chapters that each leave the reader something to consider. Wilson covers a surprising amount of ground, even discussing canon and interpretation issues. While Unbreakable would be excellent for newer believers, it should not be overlooked for this reason. I enjoyed Unbreakable like a fresh and satisfying afternoon snack (this is not me bagging the book, it’s just not intended to be a feast). In fact, its small size only adds to its worth. Of all the books I have read this year, I can see myself recommending Unbreakable most widely. Wilson succeeded in his short book, does a 500-word review count as short? This book was generously provided from 10Publishing as a review copy, but that did not affect my review. Is the Entire Book of Daniel a Chiasm?